Take what you love about the Thunder 380, add some exciting twists, and you’ve got the Thunder 380 Combat. A redesigned slide for a lower profile. A rounded trigger guard and smaller beavertail for easier carrying and holstering. Throw in larger slide serrations and ergonomic rubber wrap around grips and you’ve got a perfect day at the range. Caliber .380 ACP Action DA/SA Capacity 8+1 Barrel Length 3.5" Front Sight Dovetail Rear Sight Notched-Bar Dovetail ..
Bersa Thunder .380 Concealed Carry 3.2in 7+1 - Matte Finish. 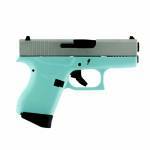 Compact and strong, a leader among concealed carry handguns. Action :Single/Double Caliber :380 Automatic Colt Pistol (ACP) Barrel Length :3.2" Capacity :7+1 Safety :Manual Front Sight :Blade integral with slide Rear Sight :Integral with slide Weight :16.4 oz Length :6" Height :4.6" Width :1" Frame Finish :Black Matte Frame Material :Alloy frame Barrel Type :Steel Alloy Safety :Integral locking system.. 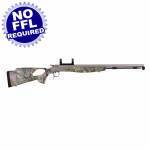 Bond Arms Snake Slayer - .45LC / .410, 3.5" barrel with 3" chamber and extended rosewood grips. Comes with the extended rosewood grips for a more comfortable grip. Interchangeable barrels of different calibers are available from Bond Arms. Stainless Steel with satin polish finish. 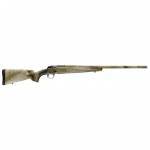 Features a crossbolt safety and spring-loaded locking lever for rapid loading & unloading. Overall length is 5.5". .. The Texas Defender is a true pocket pistol that can accept all the interchangeable barrels. Trigger guard aids in the control of the pistol when shooting larger calibers. 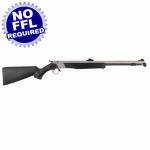 Interchangeable Barrels (Includes 3" Barrel) Rebounding Hammer Retracting Firing Pins Crossbolt Safety Spring-Loaded Cammed Locking Lever (for a tighter barrel/frame fit and Rapid loading and unloading) Stainless Steel with Satin Polish Finish Trigger Guard Weight: 20oz .. The X-Bolt Hell's Canyon SPEED rifle is built to exceed accuracy expectations. The action and stiff, fluted barrel with an installed sling swivel are bedded and free floated to ensure straight shooting. Its muzzle brake reduces felt recoil, and is easily removed and replaced with an included thread protector. The barrel features a tough Cerakote Burnt Bronze finish that aids in concealment. This rifle's lightweight composite stock makes it easy to carry; and the A-TACS AU camo is versatile enoug..
Browning's X-Bolt Hell's Canyon Speed Long Range is for the shooter who shoots all year long and loves the sound of lead hitting steel at over a thousand yards away. Built on the Hell's Canyon Speed, the Long Range adds a free-floating, fluted, heavy barrel with a sporter contour and a target crown. It includes a suppressor ready muzzle brake with a thread protector. The fluted barrel reduces weight, barrel heating, and increasing the rigidity of the barrel. This bolt action has Browning's Adjus.. The X-Bolt Predator Hunter in A-TACS AU is the perfect tool for getting a clean shot on slippery coyotes. The top-tier camouflage pattern is applied to every practical surface of the rifle, minimizing glare and maximizing your concealability. The 22" barrel is the optimal length for the venerable and increasingly more popular 6.5 Creedmoor cartridge, and it's the ideal length for handling in brush. The heavy sporter contour barrel increases repeat shot consistency for confident accuracy. Each of.. Using many of the same features and designs perfected in the Christensen Arms Ridgeline, the Mesa was created as a premium, yet accessible lightweight rifle with a featherlight-contour, stainless steel barrel and a carbon fiber composite stock. Weighing in at only 6.5 pounds for a short action, 7.3 pounds for long action, and carrying the Christensen Arms Sub-MOA Guarantee, the Mesa is the perfect rifle to carry deep into the backcountry. 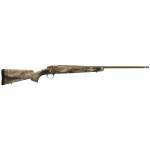 Right Hand Bolt Action 6.5 Creedmoor 4+1 22.. The Christensen Arms Modern Precision Rifle is the next-generation chassis system. Developed with a 100% proprietary chassis and weighing less than 7lbs (16” .308), the Modern Precision Rifle is built to tackle your next big adventure. 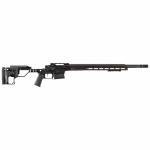 24" 416R Stainless Steel Aerograde Carbon Fiber Wrapped Barrel Adjustable Stainless Side Baffle Brake 6.5 PRC 1:8" Twist Remington 700 optics base compatible Black Nitride Finish Match-Grade “Flat” Trigger Oversized Fluted Bolt Knob Skeleto.. Since its release date, the Ridgeline has quickly became one of our best-selling firearms. 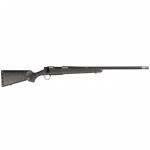 It features a signature, Christensen Arms carbon fiber-wrapped barrel, a spiral-fluted bolt, scalloped bolt knob, and a carbon fiber composite stock. In addition, the Ridgeline utilizes a bedded recoil lug, invar pillars, and carries the Christensen Arms Sub-MOA Guarantee. 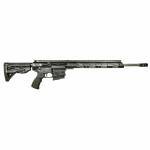 Right Hand Bolt Action 6.5 Creedmoor 4+1 20" 416R Stainless Steel Aerograde Carbon Fiber Wrapped Barrel Threaded Muzzle.. Since its release date, the Ridgeline has quickly became one of our best-selling firearms. 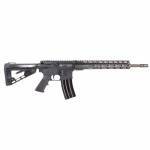 It features a signature, Christensen Arms carbon fiber-wrapped barrel, a spiral-fluted bolt, scalloped bolt knob, and a carbon fiber composite stock. In addition, the Ridgeline utilizes a bedded recoil lug, invar pillars, and carries the Christensen Arms Sub-MOA Guarantee. 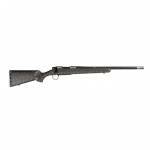 Right Hand Bolt Action 6.5 Creedmoor 4+1 24" 416R Stainless Steel Aerograde Carbon Fiber Wrapped Barrel Threaded M.. Modeled after CVA’s top-of-the-line ACCURA V2, OPTIMA V2 rifles feature the same trigger-guard actuated breeching lever, internal parts, and trigger. All OPTIMA V2 barrels are constructed of 416 grade stainless steel, and are offered in the standard stainless steel. Add in CVA’s Quick-Release Breech Plug (which is finger removable), 100% ambidextrous stock, and a CrushZone recoil pad, and you’ve got a gun with more quality features than any other muzzleloading rifle in its price range. Equipped .. The redesigned Wolf has all the features that made the original Wolf the number one selling muzzleloader in the world plus additional features. Still lightweight and easy to maneuver, the Wolf even comes in a compact version that is just the right length for the youth or small framed adult, or for the shooter who just wants a quick handling gun for brush hunting. The 100% ambidextrous stocks are available in either black or Realtree Hardwoods Green camo. The Wolf also features CVA's QRBP (Quick .. Caliber: 6.5 Creedmoor Finish: Black Anodized Hardcoat Barrel: 20” Stainless Steel Fluted Twist: 1:8 Gas System: Rifle Length Gas System Bolt Carrier Group: Azimuth Black Nitride, AR 10 Carrier w/ Multi-Cal Bolt, DPMS Style Barrel Extension, High Pressure Firing Pin Lower Receiver: Forged 7075 T6 Aluminum Upper Receiver: Flattop Forged 7075 T6 Aluminum, T-Marked Handguard: 15” M-LOK Rail Selector: Ambidextrous Safety Selector Grip: Fab Defense Rubberized Ergonomic Pistol G..
Model: DB15CCML300B Caliber: .300 Blackout Finish: Black Hardcoat Anodized Barrel: Diamondback Barrels 16" 4140 Chrome-Moly, Free Float, Black Nitride Barrel Twist Rate: 1:9 RH Gas System: Carbine Length Gas System Bolt Carrier: Azimuth 5.56 Sporter Model, Shot-Peened, Magnetic Particle Inspected Mil Spec 8620 carrier Lower Receiver: Forged 7075 T6 Aluminium Upper Receiver: A3 Flattop Forged 7075 T6 Aluminum Handguard: Aluminum 12” M-Lok Rail Pistol Grip: A2 St..
Model: DB15CCML300BB Caliber: .300 Blackout Finish: Burnt Bronze Cerakote Barrel: Diamondback Barrels 16" 4140 Chrome-Moly, Free Float, Black Nitride Barrel Twist Rate: 1:8 RH Gas System: Carbine Length Gas System Bolt Carrier: Azimuth 5.56 Sporter Model, Shot-Peened, Magnetic Particle Inspected Mil Spec 8620 carrier Lower Receiver: Forged 7075 T6 Aluminium Upper Receiver: A3 Flattop Forged 7075 T6 Aluminum Handguard: Aluminum 12” Keymod Rail Pistol Grip: A2 St.. The G40 Gen4 in the MOS Configuration is chambered in 10mm and combines a full 6-inch barrel for an improved velocity with a magazine capacity of 10 rounds. A powerful yet easily carried pistol; perfect for the outdoorsman, hunter and sport shooter. 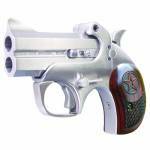 It is designed to give the handgun hunter the ultimate choice in semi-automatic gaming pistol and has proven to be more than capable of taking down game such as Whitetail Deer, Russian Boar and even Feral Hogs. Type :Pistol Caliber :10mm Ba.. 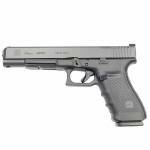 The GLOCK 19 Gen5 showcases the latest technology and engineering that drives GLOCK's constant pursuit of perfection. The G19 Gen5 features over 20 design modifications from its Gen4 predecessor, including the GLOCK Marksman Barrel, an nDLC finish, ambidextrous slide stop levers, a grip with no finger grooves, and a flared mag-well, all wrapped in a package perfect for concealed carry or use as a back-up weapon. These changes deliver improved accuracy, durability, performance, control, and flexi.. 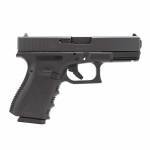 The Glock 23 combines compact dimensions with minimum weight for both open and concealed carry. It has survived durability tests and use by multiple U.S. law enforcement agencies. 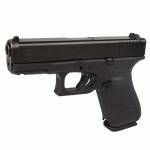 The G23 has repeatedly demonstrated its world-class durability and reliability in even the most unfavorable conditions, and countless police authorities continue to adopt the G23 as their official service pistol. Action :Double Caliber :40 Smith & Wesson (S&W) Barrel Length ..
Glock G43 9MM Single-stack Sub-Compact Pistol Robin Egg Blue. The G43 is a single-stack subcompact pistol designed to allow a more comfortable and confident shooting experience for all types of users. 3.39in Barrel. 17.95oz. ..